Each year during the third weekend in May, California’s Calaveras County becomes Frog Heaven. 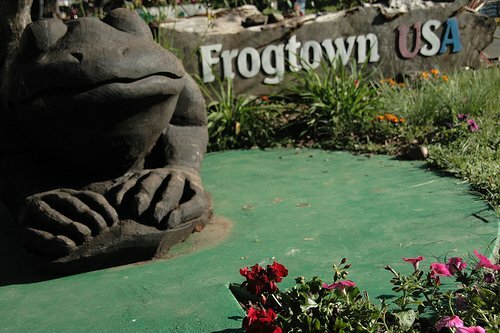 Nestled between Yosemite National Park and Lake Tahoe, just south of Historic Angels Camp and north of Sonora on Hwy 49, sits Frogtown; home to the Calaveras County Fair and its world-renowned Jumping Frog Jubilee. Using the frog competition as its jumping off point, the Calaveras County Fair also includes all the “normal” fair activities, from exhibits and entertainment to horse events and livestock showings; it’s the perfect place for the whole family to have a whole lot of fun. The first Jumping Frog Jubilee was held in 1928 on Main Street in downtown Angels Camp; an estimated 15,000 people attended. 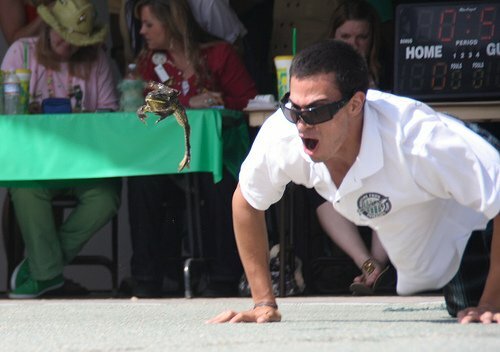 Jumping 3’6”, the winning frog was named “Pride of San Joaquin”, and was jockeyed by Louis Fisher of Stockton. By the early 1930s, attendance had crown to 25,000 spectators. The jubilee was suspended in 1933 due to the Great Depression. In 1938 the county fair and the jubilee were combined and became the Calaveras County Fair & Jumping Frog Jubilee. 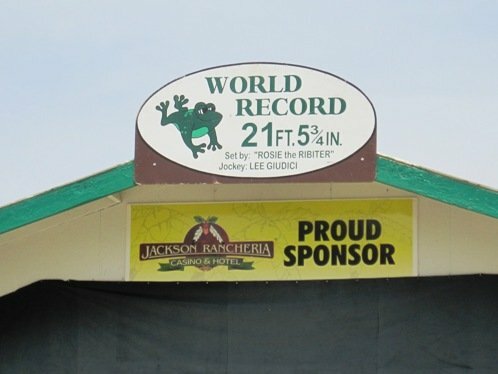 The current world record was set in 1986 when a frog by the name of “Rosie the Ribeter” jumped 21’ 5 ¾”; there is a $5,000 prize for breaking the world record. 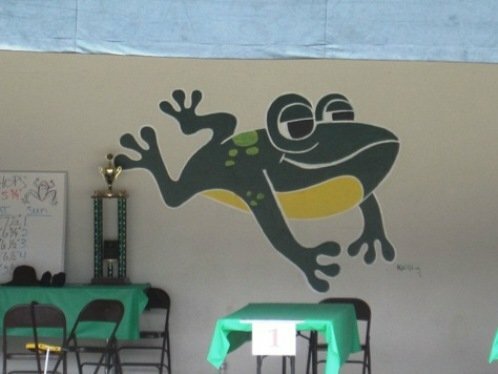 In 2002, more than 2,000 frogs participated in the frog jumps; there were more than 700 exhibits at the Fair and the junior livestock auction brought in more than $350,000 for the county’s youth. 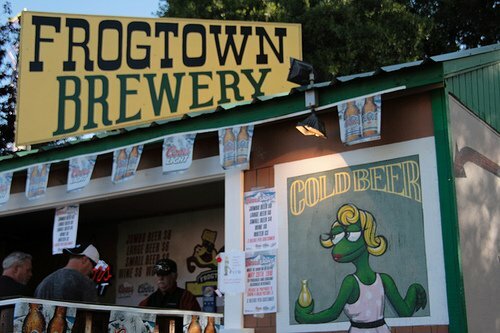 In recent years the Calaveras County Fair & Jumping Frog Jubilee has attracted more than 35,000 attendees over the coarse of the weekend, generating approximately 25.5 million dollars in revenue due to the increased business of local hotels, restaurants, retail stores, and more. 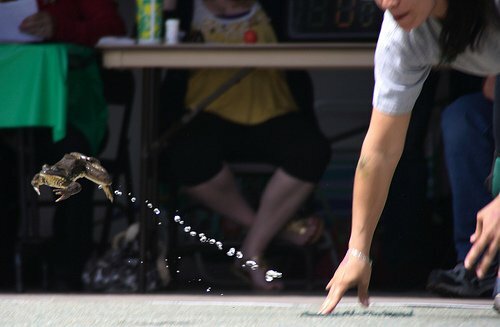 Check out these awesome action shots taken by Robert San Agustin during the 2011 Jumping Frog Grand Finals. 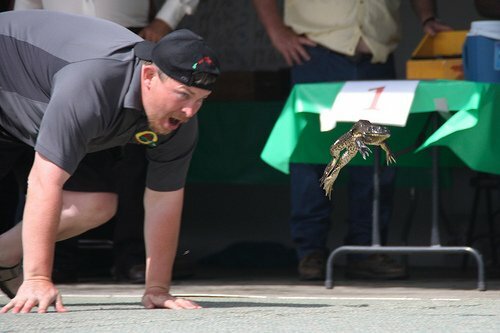 You can find more of his Calaveras County Fair & Jumping Frog Jubilee pictures on his Flickr page HERE. 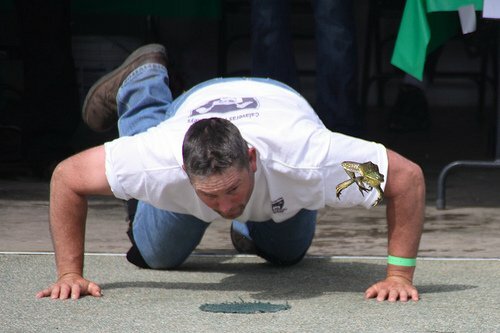 For a closer look at the 2011 Calaveras County Fair & Jumping Frog Jubilee, watch the below videos from The Tonight Show with Jay Leno….. This entry was posted on Monday, June 6th, 2011 at 3:30 PM	and is filed under Nearby Attractions. Both comments and pings are currently closed. I grew up in Sonora now living in Carterville/Joplin Mo and enrolled at MSSU. In my computers class we have to make a power point for the class 12 slides long. I picked this event to share with them. I wish I could use the video to play for them, I have had problems tying to put it on the power point. can I please have permission to use this video to share with them?